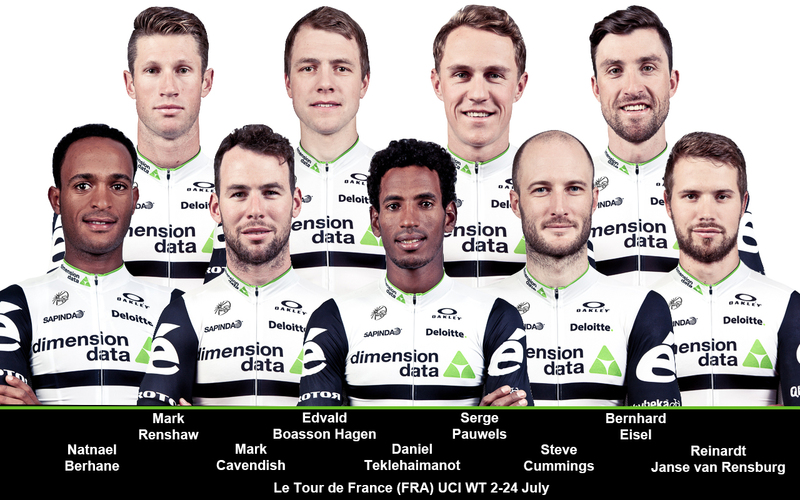 After naming a 13 rider long list for the Tour de France less than a week ago, Team Dimension Data for Qhubeka is extremely happy to announce its final selection of 9 riders that will take on the 103rd edition of the Le Grand Boucle – the first ever for an African World Tour team. 3 African riders form part of the team. Newly crowned Eritrean Road and TT champion Daniel Teklehaimanot will once again be on the start of the race. After a strong month of racing, that also saw him winning the KOM classification for a second time at the Criterium du Dauphiné, he will again try to make the fans of our African team proud. He will be joined by his fellow countryman Natnael Berhane, who will race his first Tour de France, and South African Reinardt Janse van Rensburg. Steve Cummings, who won our African team’s first ever stage at the Tour de France on Mandela Day 2015, will spearhead the rest of the line-up together with Mark Cavendish, who will seek to add a 27th stage win to his illustrious palmares. The Manx Missile will be able to count on his lieutenants Mark Cavendish,, with the latter one also being our team’s road captain. Serge Pauwels and Norwegian Road and TT champion Edvald Boasson Hagen will round out our 9 rider line-up for the Le Grand Boucle. Team Dimension Data for Qhubeka will race to raise funds towards the #BicyclesChangeLives campaign and is proud to invite fans and partners alike to join through the Qhubeka 5000 challenge during the Tour de France. The Qhubeka 5000 is an international 48-hour interactive fundraising initiative by our African team with the aim to get supporters around the world to take part and make an impact that matters in Africa. Find out how you can join this challenge at qhubeka5000.org.